I've got work in progress that ranges from billboards to labels and cash register tapes, plus all the normal printed brochures and direct mail projects. I've worked with 10 different plants and many different estimators in the past year. JOBZ keeps it all organized. The request for estimate is welcomed by all of the estimators, and the work orders for production keep communication clear and precise. Great tool. I love the expanding production details field! Look at my pretty SOP, it has all the info. Thanks for walking me through this so patiently - I am very happy now! The bottom line is, without JOBZ! I cannot do my job. I currently have four sales representatives out on vacation, and if it was not for JOBZ!, there is no way I could efficiently track their work. As you know, I am the sales assistant to our sales team, and because of JOBZ!, I can keep on top of all the various projects that each one of these sales representatives has in the system. From tracking a "Suspect" to monitoring/updating a "Working" job, JOBZ! allows me to effectively manage the work flow for these sales representatives. Simply stated, JOBZ! is crucial to my everyday ability to support the sales staff. Just had to write you to say how impressed I am with JOBZ! I have been in sales for over 15 years and have never seen a single program that does so much. From organizing my day to day sales calls, to quoting, to daily/monthly reports, expenses, budgets, etc. I am amazed how this program organizes my daily schedule. My desk used to be cluttered with folders, post-it note, etc., but with JOBZ! everything is right in front of me with a click of the mouse. No more wasting time searching for papers, notes on napkins, memos for specific customers. If I need to send an e-mail or letter to more than one customer (i.e. price increases) just a few clicks and it prints out to all I have selected. Turn a request for estimate into a proposal, just a click. Turn a proposal into an order, same thing. The time I save is really unbelievable, allowing me to spend more time concentrating on customers/prospects. Realistically I have 20%-30% more time available per day to focus on my customers. JOBZ! really does make you work smarter, not harder! I used JOBZ! for the first time about seven years ago, and I thought it was a brilliant, easy to use tool back then. Unfortunately, after moving on to a different print company who did not have JOBZ!, I had to do without its efficiencies, and my job as a print sales rep was not nearly as easy, and my time was spent using inferior and/or obsolete methods for record keeping and generating useful reports. When I accepted a new position with my current employer, I was elated to learn our company provides JOBZ! to us. After seven years, I came to find JOBZ! to be even better than it was when I first used it, and Jim Taylor has been a real professional in training and continued customer service after implementation of the product. I think it is the best tool for any print sales professional, and I highly recommend it! I have been working with JOBZ! for 15 years now and on the rare occasion I have not had access to it, I feel like I am working with my arms tied behind my back! Not only has it has helped keep me organized and efficient with jobs and quotes, but having all of my client information and history saved in one place, is invaluable. I don't know what I would do without it! JOBZ is the best tool for sales and managing in the industry, I have always used it and will always use it.It is without a doubt a must for sales. It's definitely light-bulb going on kind of software. This is just absolutely the best program available in the industry- it's fantastic as a sales tool. We love JOBZ! It elevates our professionalism, makes us more profitable. We cannot imagine our business without it. After living with this program day in, day out for the last 7 years I can say it is an integral part to our company's success and growth. It flat out helps us to get our job done! JOBZ! has been a great sales tool for me. It's helped me take advantage of technology in many ways and become more efficient. I highly recommend it. I am thrilled that we finally have JOBZ! and with how easy it was to start up and know that I'm only scratching the surface on it's capabilities! I especially like the fact that you have returned for meetings with the sales staff to discuss ways of even improving/customizing the software for us...can't get that from Microsoft! Best of luck and much continued success. Jim, please stop promoting JOBZ! As long as my competitors don't have it I am taking the order, ordering paper, delivering a paper dummy and processing the Purchase Order before my competitor can even quote the job. My success is directly tied to JOBZ! Stop selling Jim!! Any printer who is not using your software stands a good chance of losing his profitability. I have found this the easiest way to track costs and stay on top of customer changes and additions. (All of those little slips of paper seem to get lost!) My customers, too, think I know what I'm doing when I submit a quote that is complete and concise yet all encompassing. The look is consistent and easy to read. So, my customers end up knowing that I KNOW what I am doing! How sweet is that? As a user of JOBZ! since 1993, I am a firm believer that this program has been very instrumental in my success. The depth of offerings is second to none. From prospecting to follow up, from estimating to billing, it has everything you could ever want. The effectiveness of the program allows for more time to sell instead of doing paper work. Thank you Jim for making my life much easier. It's the easiest way to sort through information. It's user friendly and, yes, it saves me a lot of time. I can’t imagine selling printing without JOBZ!– using JOBZ! makes you organizationally more efficient, requires you to be more thorough with the details of a project, keeps modifications to a project clear, makes communication easier with everyone involved in the project, and ABOVE ALL, JOBZ! is easy to use! Yes - this is an industry focused tool, there's nothing like it. It helps communicate printing job essentials from estimating to quoting to order entry with intelligent defaults. The generic tools just don't cut it! I have used JOBZ! for a little over a year. I can no longer do my job as effectively without it. It definitely helps keep me organized, and having all my information (past orders, lost jobs, etc.) within a few clicks is invaluable. I would highly recommend it to any sales person. Thanks for making my job easier. We could not manage our business from a sales point of view without JOBZ! I can not express enough how much JOBZ! has simplified the process to work with all departments in one facility. From the management level to estimating to sales and production. I could not imaging try to sell print without JOBZ! Yes, I would highly recommend this program for any sales person that is involved in the printing Industry... It does make life a little easier, especially with today's demanding turnaround times. I just printed a mass mailing to 407 contacts. Each letter was personalized. I sent a sample packet with the personalized letter and the quality was great. I printed the letters and labels in less than 15 minutes. To be able to deliver timely job estimates, job entry and tracking, merge mailing capability, reporting, billing and correspondence from a satellite office has been paramount in my ability to maintain the exemplary service model my customers have come to expect. Without JOBZ! I am certain I would not have been as successful as I have been to date and am certain to be in the future. JOBZ! has become a natural part of my daily workflow. I was not a computer guy, but I’ve become a big fan of JOBZ! My estimator loves the fact that I am using JOBZ! now and so does my CSR. It makes their jobs easier because the write-ups are so consistent and organized. I love the expense report. Run don't walk- as a 10 + year user I would be lost without JOBZ! JOBZ! enables me to enter and keep track of all my business, whether in estimating, production or billing, in a way that is quick and easy. A day without JOBZ! is like a day without a phone or a car. I cannot say enough about JOBZ! We could not function without it. What a terrific time saver and data organizer. It takes the paperwork out of production. JOBZ! is very important to the overall performance of my business. The ability to make fast changes to specifications allows me to communicate clearly with my customers, estimating and my planning. This puts everyone on the same page at the same time. JOBZ! is designed and created for the printing sales professional who requires time saving methods to aid them with their paperwork requirements, and cannot afford to sacrifice the quality and accuracy of the information. Best contact manager specific to the printing industry. JOBZ! gives me total control. As great as I thought JOBZ! was, the new version is again a quantum leap forward for us print sales people. It saves endless time with all the features you've added. Keep inventing new ideas, although I find it hard to imagine it could get any better. Only hope I'll be retired before the next version hits the industry. In my experience JOBZ! is the only sales tool to use. A must-have tool for all sales reps and sales managers in the printing industry. I have used it with a number of companies over the last 10 years and the latest version is even more valuable than ever. As a print broker, JOBZ! gives me just about everything I need to run my business with fewer staff than is normal to keep things moving in a timely fashion. JOBZ! is the key to my organizational successs. Without JOBZ! I would have to work 1000% harder. We have had the pleasure of using JOBZ! in our working environment for 6 years. After that time it is hard to imagine how much time we have saved in record keeping and production management, let alone the money we have saved by keeping up on timely, accurate daily communications with our clients. JOBZ! has had a direct effect on our ability to maintain our primary goals of producing great work , on-time, within budget and therefore the success of our company. I run my company with your program. I couldn’t live without it. All of us use JOBZ! every day. It keeps us extremely organized and on top of our projects. It allows us to handle a larger number of projects and handle all the detail items. We get compliments from both clients and resources regarding how thorough we are. We take the credit and say “Thank You” but do not tell them it is our “JOBZ! software. I do not recommend things lightly or often, but I fully recommend this software to anyone in the industry. This is the only program we we use to operate our company. Great job! Excellent product! PS: Our labels and packages all look extremely professional when printed out from your software. JOBZ! enabled me to communicate to several remote facilities in an accurate and consistent manner, as well as provide my clients with professional and unambiguous communications. Having JOBZ! in a direct line of process with getting the job done instilled a system of organization and record keeping that I wouldn't have had without it. The challenge of organization on many levels is the most important aspect of working in today’s environment. Connectivity, streamlining information and eliminating redundancy are key. The JOBZ! program, when fully utilized, meets these requirements. If I didn’t have JOBZ! this month I would have gone crazy! When you get swamped with estimates, orders and production communication, the program saves you from a complete meltdown. I can’t imagine trying to compete in this business without JOBZ! Input all your information just once- the initial time investment pays off continually. JOBZ! is, if used properly, the best sales tool I have ever seen. Having a program that keeps you organized and reminds you of all of your contacts, conversations and important dates, can only help in building better relations with your customers. This program is so easy to operate, I just fly through it. I’ve been using it for 10 years now, and it completely minimizes my paperwork time. JOBZ! is the secret to my organization. I have been selling with JOBZ! for many years with great success and now I'm using it to manage an entire sales force. If you sell printing and don't use JOBZ! you’re crazy. JOBZ! will help you more than any (blankety-blank-blank) sales manager. I’ve only been using JOBZ! for a few months. As I have become more adept at the program, I realize how efficient it makes me. Just today I was able to save a lot of time on a complex bid using two envelope sizes, two different papers per envelope, and plate changes per print version. The Clone feature made the quote request fast and easy. It (JOBZ!) changed my life! JOBZ! has been the only way I've been able to resurrect my business. It's like a familiar old friend. I'm able to prospect with ease, turn estimates into jobs and everything in between. Thanks again for JOBZ! The anonymous responses below were from a user survey, in response to the final question: "What would you say to a sales rep, sales manager or company president who asked 'What about JOBZ!? Do you recommend it?'" I would recommend JOBZ! for almost any size print company. Get it and use it. It will simplify all aspects of sales, reporting and management. So far I am finding JOBZ! really fast and easy for RFEs, pricing, and quotes. Now if I could just close some printing business, I'd find out all about ordering, scheduling and ACs. I could not easily run my print brokering business without this essential tool. JOBZ! is indispensable for estimating, proposing and tracking live projects. The amount of time and replication I've eliminated in processing information gives me more time to focus on my clients' needs. Terrific tool! Can't imagine running my print brokerage without JOBZ! I have been using JOBZ! for 15 years at various companies and could not imagine working without it. Thank you, Jim Taylor. It is essential to keeping track of things. I feel it is the best software around. 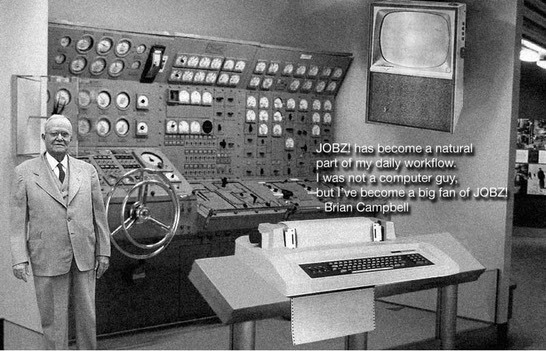 Thanks to JOBZ!, I am more efficient, more organized, and more productive than my competition. The most demanding print buyers are loyal to me because I consistently quote their projects quickly and accurately. My competition (the ones without JOBZ!) are always lagging behind. JOBZ! is a great program. I've been using JOBZ for over 10 years and this version is awesome. I'm using it for marketing as well as for all my internal communications. I can't imagine doing my job without it. If you are not using it all the better for me. My sales staff will win the business from yours. An essential program for tracking and internal communication... a great way to stay organized and aware of what you are selling. It is the most awesome thing I have ever spent money on. I would highly recommend it! I would certainly recommend it, having used it for 14 years. Don't leave home without it. I highly recommend JOBZ! I have used it since 1994 and know I have saved hundreds of hours looking things up and re-entering information. The more options I use the more valuable it gets. I would recommend the program. It feels like it was designed by someone who really knows printing. Absolutely the best system out there for this industry.